Hoy vamos a tener un día de Steve Hillage, simplemente porque lo pidieron y porque nuestro amigazo venezolano Lino nos manda los links de descarga para que lo compartamos en el blog cabezón. Ahora con un disco de solamente dos canciones para pasar 40 minutos flotando mientras se escucha la música casi ambiental, etérea, a veces espacial, pero siempre múaica soñadora. Este es un álbum necesario para cualquier persona que disfruta de la música ambiental. Extrañamente ni siquiera al hablar del propio Steve Hillage se le da gran importancia a este disco, a pesar de que aquí estaban ya las bases del sonido de grupos como The Orb, que si suelen ser fijos en este tipo de listas. El disco carece de base rítmica y tiene un sonido orgánico-analógico asombroso, la banda sonora ideal para sentarse en el campo en una noche estrellada y volar observando las estrellas y las distintas constelaciones, evocando todo tipo de imágenes cósmicas. Similar al sonido de las estrellas hecho música si es que eso fuese posible, parece obviamente influenciado por el vampiro Klaus Schulze más cósmico, pero suena muy personal, definitivamente un disco de belleza pura y majestuosa. Eso con respecto al disco, vamos a dejar otros comentarios y los links de descarga. Sitting "Rainbow Dome" in the Canterbury scene because Steve Hillage comes from there; is quiet undeserving; not because there is something wrong with that scene; but mainly because this effort goes beyond that sole stage, This work will also be sitted more comfortably among the electronic-prog people or their kraut counterparts or better yet; among the 3. "Canterbury"; because it has all the "back to nature; psychedelic approach"; "Electronic" because as raw as "recorded in a hut" it seems; it uses wisely electronic gadgets and synths available at the time plus Steves´s long time electric accomplice; and also because the work itself has the feeling of long environmental conceptual ambiences; this genre was so famous for. And last but not least; the whole thing; as sacred as it seems to be; has the loosen up attitude the "Krauts" so dearly enjoy. In todays fashion this could easily be called very early "New Age Music". A category that then turned to be called "Ambient". So also; it could be named early "Ambient Music"... Un-pretentious and quiet away ahead of its time; a 2 "vinyl sided" single compositions (44 min in total); that should not be overlooked by people who dig the sub-genres mentioned above and proggers who like to know what happened before midi.-- 4 very deserving stars; mainly for being ahead of its time. A shift over into progressive electronic New Age realms, and the missing link between Steve's solo career and the later System 7 work. Like System 7, the album is a full collaboration between Hillage and Miquette Giraudy, who composes the entirety of side 1, and like System 7 it was originally conceived as chillout music, in this case for a mind-body-spirit festival in London. (In fact, System 7 came about when Steve realised that UK nightclub DJs were incorporating elements of this album into their chillout sets.) If you want placid and tranquil relaxation music, it's a pretty good example of the form, though it does require a bit of patience - both tracks take a while to get going, but they're great when they do. 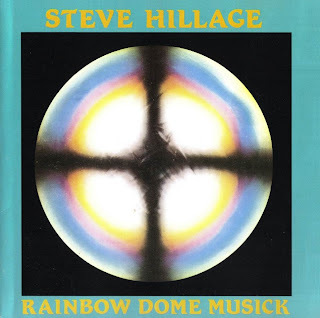 Guitarist Steve Hillage has almost done more for space travel than Neil Armstrong, and this spacious release entitled 'Rainbow Dome Musick' may well confirm that. Our favourite Hippie and his synth-tweeking partner Miquette Giraudy recorded two side-long pieces for the Rainbow Dome at the festival for Mind-Body-Spirit in April of 1979, so this does have a 'New Age' leaning but doesn't lend itself to be relegated as mere meditational back-drop, these are thoughtfully constructed, passionately arranged and performed slabs of spacey colour and emotion. Of course, one has to enjoy this sort of thing in the first place, and, more often than not, patience is rewarded. The A-side features Miquette's 'Garden of Paradise', and contains many layers of ARP synths, Rhodes e-piano and some delicate lead guitaring. Never in a hurry to get anywhere, its atmospheres are lush and tranquil. For those unfamiliar with Gliss- Guitar, this is a technique where a 'device', such as a guitar's whammy-bar (or tent peg, or screw-driver etc.) is rubbed up and down over the guitar strings on the fretboard. When the sound produced has been treated with tons of delay and reverb effects it creates this incredible, magical, sustained sound. The 'device' can be slid up and down the fretboard, and depending on the angle of the 'device', it can cover chordal or solo lines. An E-Bow is similar but never sounds as smooth. So, Steve's piece, 'Four Ever Rainbow', is dominated with these cosmic guitar Glissandos as well as a droning synth core. Towards the latter half, chirping synths come to the fore. These 20 minutes pass by rather quickly. If I may relate an anecdote - once whilst listening to this track, at one point the backing glissando was sliding up note by note, gradually becoming thicker and fatter in sound, and I had the feeling I was hovering a few inches off the floor. Wow, I'm levitating !! It lasted a few seconds but it happened, and without the aid of any chemical enhancements. Or, I may have been drifting off to sleep.......This is pure symphonic Gliss like no other. At any rate, yet another excellent and effective album from the Electrick Gypsy. Unobtrusive synths and proto sequencers are used liberally on the opener which lasts a whopping 23 minutes. Very similar to modern day equivalents Steve Roach and Robert Rich, you can see where those artists got some of their inspiration from. 'Rainbow Dome Music' is a slowly evolving, laid back, peaceful affair and is one of the best renditions of 'ambient' that I've heard. Some really nice high pitched electric guitars weave their way gradually into the album but are sensibly kept in the background and used frugally. One good thing about this album is that it's not cheesy at all. It sounds almost timeless. The second and last track 'Four ever rainbow' continues where the last one finished. Walls of keyboards dominate as a few bloops and bleeps emerge here and there. Guitars are so effected that they no longer sound like guitars and appear as washes of keyboards. I just don't know, why i like this album.. There aren't Steve's guitar solos and it doesn't look like early works in their traditional prog sounds. Rainbow Dome Music has a good music's atmosphere with some space effects, typical for new genre at that time - "progressive electronic". I can't stop listen a hypnotic effects, which are on every Steve's album in different ways. By far Hillages best post Gong Lp this is an ambient masterpiece. It is also the first LP by Hillage post Fish rising with acceptable lyrics IE none. Miquette Giraudy Finally out grows her rather cruel Didier "Bloom" inspired nickname of the cosmic camel and shows what a very competent synthesizer player she had become. There is very little one can say about the music that has not already been said very well but walls of color come to mind. If only all Steve Hillage records were as interesting as this one. Available on clear vinyl at a time when such fancies were still unusual this record also boasted a slightly cut price 1st run. Although it did not sell as well as L or motivation Radio it still sold relatively well which demonstrates that Hillage even then had a wider appeal than just pure acid rockers. In one word wonderful. 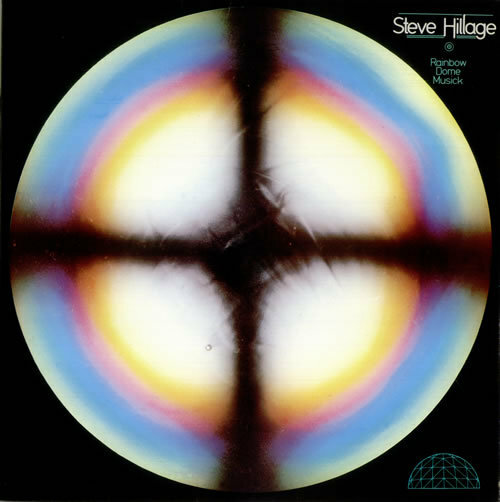 This recording marks a distinct change in musical direction and finds Steve presenting what essentially amounts to an early New Age/ambient recording. For those who delight in subtle textures and atmospheres, this entrancing and hypnotic mood piece will soothe and satisfy. It is a fine representative New Age record but lacks the compositional and musical feel of a progressive rock album. I manage to play this recording about once or twice per year for the relaxation effects and not because of any profundity of the musical statement. It is worthwhile for what it is. But if the expectations are that you are going to hear music similar to previous recordings, you are setting yourself up for disappointment. It's not very fair to review the album as progressive rock because it just isn't progressive rock. It would be like classifying Snow Patrol's latest album as progressive rock simply because the last track is over 16min long. As an album of new age/ambient music, it is among the best I've heard - right up there alongside Steve Roach's "Structures from Silence" and Fripp & Eno's "No Pussyfooting". Whereas some ambient pieces just hang there in perpetual nothingness, this album does at least have some movement and development. It won't appeal to fan's of Hillage's trippy brand of space rock, nor will it appeal to the purest of prog- heads, but it's one of those albums you never know you'll like until you hear it. It shows a very different side to Hillage and, seeing as it's his first and only excursion into ambient music, it's executed very well. The album is unlike the remainder of Hillage's work, due to the ambient nature of this album. Featuring only two lengthy ambient pieces, this is an album of blissed out tranquility, a masterpiece of the ambient genre. The dominant instruments are the synthesizers which wash over the listener in waves throughout. Aided by Hillage's heavenly guitar work, the music really does provides the most relaxing experience. Of the two tracks, Garden of Paradise is the most popular, featuring more of Hillage's guitar, however, my preference is for the second piece, Four Ever Rainbow, which is the more ambient of the two. The familiar sound of Tim Blake's crystal machine is in evidence, and the many keyboard sounds provide a backdrop of stunning beauty, at times a little edgy, but nonetheless very peaceful. I do appreciate that this album will not be universally popular with fans of more mainstream prog, only those with a strong inclination towards electronic or ambient music can be expected to really appreciate this. However, for me it is a great album and for fans of ambient and electronic music I would consider it to be a very important addition to their collection. Y esperen un poquito porque hoy tendremos más Hillage, siempre atendiendo a sus pedidos. Y una recomendación, a esto descarguenlo rápido porque no está en Mega y por lo tanto los links tienen los días contados. El que avisa no es traidor. Lino, hay varios que pidieron esto así que gracias. Y no sé si viste que te dejé un mensaje en el Laberinto: falta el link de Live Herald (1989), lo espero para publicarlo!